There are several general methods for connecting a BlueRail board to a locomotive. If you are plugging your BlueRail board into a “DCC-Ready” locomotive equipped with a 9-pin connector, simply plug the board into the connector (and you are done). If you are plugging your BlueRail board into a “DCC-Ready” locomotive equipped with a 8-pin connector, it is important to orient the connector correctly (as the pin can be inserted one of two ways). Please refer to the diagram below for reference. The circuit board in your locomotive should have a small triangle or dot indicating where the number 1 pin (orange) should go, which will help you orient the 8-pin connector correctly. (It is possible the number 1 pin location is not marked.) If you connect the pin in the wrong orientation, your locomotive will run backwards and the lights will not work. If after installation you find this to be the case, simply rotate the connector 180 degrees. It is probably a good idea to launch the app and test your motor and lights before putting the shell back on your loco. 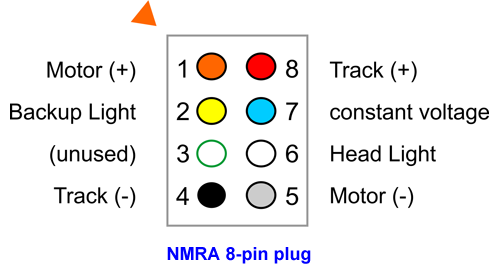 If you are directly wiring your BlueRail board into a train, please refer to the diagram on this page for how to connect the colored wires from a 9-pin harness. There are two mistakes that are easy to make when wiring these connections: it is easy to accidentally get the polarity wrong on either your track connections (red+ / black-) or motor connections (orange+ / grey-). If this occurs, your locomotive will run in reverse. It is probably a good idea to launch the app and test your motor before putting the shell back on your loco. Although we will create a place in the settings for you to correct for this, it’s best to get the polarity right in your wiring. BlueRail Trains has developed a bluetooth smart control system to allow you to directly control model trains from your Bluetooth Smart Smartphone or tablet without any additional equipment.